There's a lot of excellent ways to encourage customers to visit your shop, but one of the most fun is with a birthday invite! Whether you're simply reaching out to say "happy birthday!" or sending them a coupon in honor of their special day, they'll be happy to hear from you. 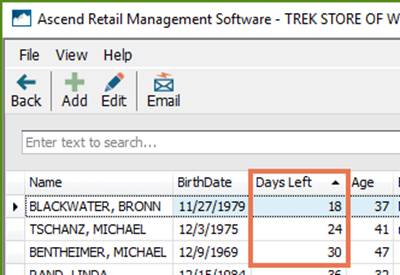 And you can easily track customer birthdays in Ascend. 1. 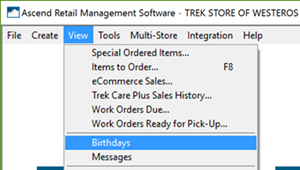 From the Ascend desktop, select View > Birthdays. If the customer's Customer record includes their email, you can email them directly from this page. 1. Highlight the customer you want to email. If they have an active email address, the email icon will be active at the top of the page. You can highlight multiple customers (by holding Control on your keyboard while clicking) who have attached email addresses to email more than one person at a time. 2. Once the customer is highlighted, select the Email icon. 3. An email window opens. The subject is automatically filled with Happy Birthday!. If you selected multiple customers to email, they will be BCCed (and not be able to see who else was emailed). 4. Edit the email as needed. 5. 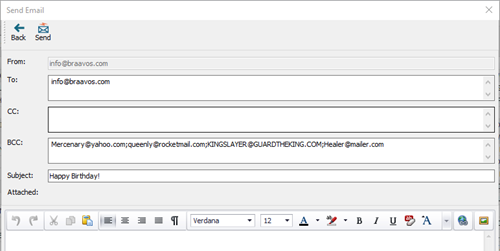 Click the Send icon when you're ready to send the email.